This week's lesson was all about paste, glaze, and clusters of goodness. I combined a whole bunch of trinkets on my left page, using an already gelli printed chipboard coaster as the base. That fun light bulb chipboard piece is from Blue Fern Studios...love their stuff! I also added a bunch of other fun goodies, such as a partial tag (see the burnt edge! ), buttons, a piece of crinkly plastic, and material. The coaster was embedded into the wet paste and then the other elements were glued on top once the paste was dry, which took overnight. The right hand page also featured some pieces of masking tape, also embedded in the wet paste, vintage text, another tag top, and a few other goodies. My sentiment, by Catherine Scanlon, is also featured on this page. Now can we just stop a minute and talk about the inclusion. Do you see that circle in the middle of the inclusion? Oh man, that makes me do the happy dance. I LOVE it! It was created by accident when I was applying paste to the other side of the paper...this side ended up pressing into the coaster. When I pulled the paper up, that circle was left behind..swoon...Once the glaze was added, it appeared by magic. A few random numbers added to this page and this week's lesson was complete! This was a really quick project to complete, once the paste was dry. There was a boatload of paste on these two pages and it look almost 24 hours for it to completely dry. I hope you enjoyed today's project and if you're interested in learning how to make projects like this one, sign up for Donna's Inspiration Wednesday videos...it's only $35 for the entire year! I started this card by creating a background using Wendy's Archival Re-Inkers and Specialty Stamping Paper. See this post on Wendy's blog to see her technique for creating these fun and super easy backgrounds. I created the oval window on my card by tracing around a mask from one of Wendy's stencil/mask sets. I use this set constantly! I confess that the images I used for this card are from an older Wendy set, I'll try to find a link for you. All of my images were stamped in archival ink and then colored with Tim Holtz Distress Markers. The flower image was watercolored with Peerless watercolors. Once all of my pieces were completed, I fussy cut them and added some Glossy Accents to every piece. You can just see the shine in the photo above. The "shelf" was created by using an Arts Parts piece that was covered with vintage text paper. I stamped over the paper and added some twine and a random metal piece. Before I assembled my card, I added some stamped leafs in the background, just to add more fullness to the entire layout. Once my individual pieces were completed, I attached everything with a combination of liquid glue and foam tape. This combo creates great dimension on any craft project. The sentiment was stamped on cardstock and then each word was cut out and attached to the card. Cutting the words apart allows me to put a sentiment in any type of layout I want vs. being tied to the exact layout of the stamp. Some faux stitching, from one of my very favorite Wendy stamps ever, was my finishing touch. I hope you enjoyed today's card! I'll be back in a few days with this week's Inspiration Wednesday project! Can't wait to share...it's dreamy... Check out the links below to purchase products used on my card. This is my project for the first week...and I am crazy about it! This week Donna combined my love of embossing paste, stencils, glazing medium, and (of course) teal paint! I am working in one of Donna's handmade journals, which are 6"x9", a perfect size for quicker projects and easy storage (or for art on the go). This is actually the last page in my journal as the first few pages already contain various completed layouts. I'm giddy over the aged pages that contain just a hint of color...dreamy. This has to be one of my all time favorite art journal pages. I'll leave you with more photos from my project along with product links, at the end of my post. I'm not a huge "word of the year" person (see Ali Edward's blog), however, the word grateful is one that has been popping up in my head over and over again this past few weeks so I opted to highlight my word on my first IW2016 project. My word was tucked in among a variety of papers, tickets, twine, and ribbon. This is the opposite side of the inclusion, the other side has the word grateful on it, and this might be my favorite part of the entire piece. This little snippet makes me want to create an entire page filled with embossed number, blue flowers, and orange splotty dots! I hope you enjoyed today's project! Consider signing up for Donna's Inspiration Wednesday video series so you can see all of the specific techniques used on this, and other, projects. Guess what? I made a card! I don't think I've created any cards in months and months...or at least it feels that way. It was wonderful to be back in the studio this week creating a simple card. My inspiration? 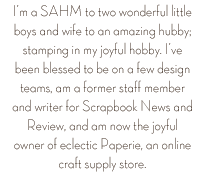 A technique, highlighted by my friend Dina Kowal, on Splitcoaststampers. Splitcoast! Goodness, it's been even longer since I was posting on Splitcoast...maybe three or four years! No guarantees on whether or not I'll be back on SCS on a regular basis, but it's fun to participate with a challenge and share a card. (You can view my card gallery here). Last week's technique was called Texture Pressing. You can read the tutorial here. The reason this technique caught my eye? 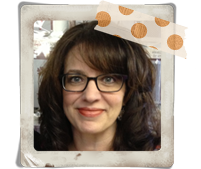 It's one that Wendy Vecchi has taught for years! It's a perfect technique to use with her Embossing Paste. This is a super easy technique, but I grabbed a few photos to share of my progress. There are a lot of pastes on the market now, but Wendy's remains my favorite. I use it almost every time I create. It's lightweight, fully flexible when dry (it won't crack or chip! ), provides amazing height and texture vs. some other pastes that dry rather flat unless you use a lot of paste, and takes color from any medium - paint, re-inkers, ink pads, you name it - perfectly! To start my project I spread some embossing paste on a piece of scrap cardstock. To create the texture, simple press a stamp into the wet paste. I used a variety of designs in my paste...just for fun. Set the paste covered paper aside to dry completely. Once my paste was dry I simply colored the paste with a few Distress Inks. I used Shaded Lilac on the middle and Seedless Preserves on the edges. The very dark areas are ones that don't have any paste...it's just cardstock. I love the color difference and the way the darker ink gets picked up on the paper. I also gently went over the entire piece with Gathered Twigs. Here are the three main elements of my card; the texture pressed piece of cardstock, a flower from the Wildflower Art set, and a die cut circle, which has also had a bit of Gathered Twigs added to the edges. (The flower was colored with Faber Castell Big Brush Markers and a water brush). To finish my card, I added a piece of silver painted cardstock behind the textured piece, added faux stitching, a stamp from the Just Sew Artsy Wendy Vecchi set, to a few places on my card, and added the sentiment, which was taken from a Tim Holtz Chit Chat sticker book. And there you have a quick and easy card that utilizes a quick and easy technique! Why don't you give texture pressing a try? I'd love for you to share a project with me! Just leave me a comment with a link back to your blog and I'll stop by for a visit!